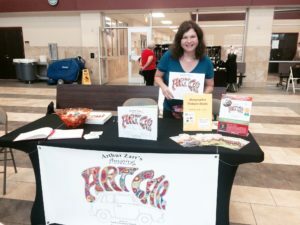 Promoting my children’s book has become a favorite pastime! 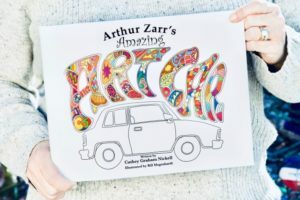 This week—May 3, 2016 to be exact—marks the six-month anniversary of the launch date of my children’s picture book, Arthur Zarr’s Amazing Art Car. I thought it might be interesting to celebrate the occasion with a breakdown of numbers and other fun facts. 1,000,0005 = number of schools I wish I could present to! Countless = number of art car daily drivers and other new friends I’ve met as a result of writing this book. Jason Rounds = friend who drove the farthest to attend a book signing event (Jason and his daughter drove 1 hour from Texarkana to Shreveport). Two of my relatives, Shawna and Amanda Cotten, did the same! 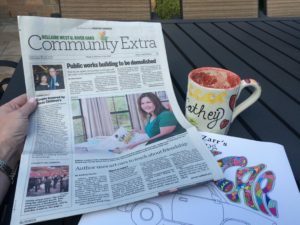 Thank you, Houston Chronicle, for the front page Community Extra article! THANK YOU, to Bill Megenhardt, for your amazing illustrations and wonderful collaboration. And, THANK YOU, to everyone out there who helped make my publishing success possible. 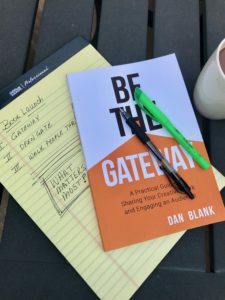 I appreciate every book purchase, every Facebook like or share, every re-tweeted Twitter message, and every friend or stranger who showed up at a book signing event. I appreciate all the creative art car artists who have welcomed me into their fold. The thing I’m the most proud of is that Arthur Zarr’s Amazing Art Car has inspired so many children to open up their imagination in countless ways. I remember the boy from a Houston school who said, “Mrs. Nickell, I went straight home after your talk and wrote and drew my very own art car book.” I feel like I’ve left a small mark on the world, and it’s been a life-changing experience for me. Be like Arthur Zarr … be amazing!